I have the same problem. When I try to apply your fix I get to the Advance dab under options, but then do not see “Config Editor button”. My Thunderbird Version is 3.1.7. @Gary: Whoops, apparently I left out a minor but fairly important detail. Make sure after you click on “Advanced”, you are looking the first tab (“General”). That should do the trick! I updated my instructions – Thanks for pointing that out. When will the not using default printer problem be fixed? It has been there for 3 years at least. Come on you can do this!!! Worked great! Thanks so much for posting this fix! FYI… I had the same problem in Firefox. Similar fix: type about:config into the address bar, hit enter, type ‘print’ into the filter field, find that same print.print_printer entry and do the same thing — right-click on it and select reset. Thunderbird ignores my default printer and tells me I have not printer attached. The notice about rest does not apply as the windoze 7 has different settings. Hi Klaus, I’d check again & just make sure you follow the instructions carefully. Thunderbird didn’t change the setting, & Windows version makes no difference. (Windows 7 is what I’m using, BTW). Let me know more information if I’m missing something & I’ll try to help out. Thank you! Brought a smile on a dull day…and it worked! This works *most* of the time. However, if your windows default printer is a networked printer and you have another printer connected directly into this computer, Thunderbird insists on using the printer that is plugged directly into the computer even if the print.print_printer is set to your windows default network printer. I have not found a workaround and I have reset the print.print_printer key several times. I installed a couple of new printers yesterday, I already had two on the network and one of the new ones was also put on the network, this new one took precedence in TB even though the local USB photo printer was installed last. I recalled having to reset something in the config and came across this post. I reset the above suggested print.print_printer which was still set to my old preferred default even though TB was using the new network one, I then saw further down the list another one titled something like ‘print.print’ or ‘print.printer’ with the name of the printer that had now taken control so I decided to reset that as well. I’m not sure if that was a good idea but now TB has gone back to the printer I want as default (cheap to run and quick B&W laser). Hope that helps someone. Why do Mozilla do this? How about a simple setting in the main config window? I have same problem. TB wants to use Microsoft XPS Document Writer instead of Canon MX860. Canon is wireless network printer. TB sees it and if I change it will print. Following the advice in this thread is not working for me. Running Windows 7 x86, and there is no “print.print_printer”setting. If I put that in the filter box there are no hits. There are several entries for printer_Microsoft_XPS_Document_Writer, but none of them suggest it controls default. Do I need to reset all of them? Where is the print_print_printer? I’m obviously missing something. Hmm, okay, try filtering for just “print_printer” & reset that instead. I searched around a bit & it seems like Thunderbird may have done away with the “print.print_printer” setting, so you might not see it if you installed a recent version rather than upgrading. That’s just my unscientific guess what’s going on, since it seems like you’re not alone. I still see “print.print_printer” & lots of related settings in my copy (Thunderbird 7.01 under Windows 7 64-bit), but I’ve been upgrading versions since Thunderbird 3.1.7 (December 2010). Thank you! Never would have found that, and it worked perfectly. Thank you so much! Before I came here I was looking around in the config file print settings for something like “default”. I would NEVER have thought of right-clicking and then trying reset. Awesome! Thanks Wick. Your post combined with the addendum added by MrArtist (September 26, 2011 at 3:05 am) did the trick for me. I notice that on re-opening the config window after these settings were reset to default, these “Preference Names” seem to have disappeared from the list (TBird 10.0). My thanks also. The comment about print.print occurring more than once was key for me. After resetting two occurrences, my computer is now using my older Windows default printer (Which I want). I’m curious – The problem just started a couple days ago, after working “properly” for two months after I installed a new printer (Meaning it was successfully using my old printer for two months, then suddenly switched to the new printer unexpectedly). 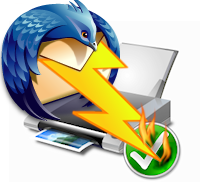 My Thunderbird version is currently 10.0.2. I’m not sure when it last updated. Works like a charm! Your description really hit it on the head – easy. Thank goodness was able to find your posting, for which am grateful. Just wish Mozilla would read this and do something. This trivial problem was really starting to get annoying!!! I reset the print.print_printer parameter but doesn’t worked, then I’ve found print_printer parameter and reset as well. Now is ok.
Running Windows 7. There is no listing for print.print_printer and it is defaulting to the wrong printer. Try looking for “print_printer” & reset that. 1. Deleted printer from computer, setting another as default. 2. Reset every about:config line item relating to the printer. 3. Temporarily renamed prefs.js file and opened Firefox to create a new one. 4. Shut down Firebox and set renamed prefs.js back to old name. 6: Rebooted computer, allowing XP to find and install the printer. 7. Opened Firefox and problem was solved, now defaulting back to portrait print mode. Probably half these steps had no bearing on resolving the dilemma. Also not sure I did everything in the precise order stated above. But it worked. Wahoo! Works perfectly on Tbird 31. Many thanks for getting rid of my small annoyance! yes, it works great if you search on print_printer and reset that. If you search on other text strings with “print” in them–like print.print for example–you will get many hits listing your old printer, but when resetting them, they don’t work. This is the quintessential problem with free software. print.print_printer or print_printer is “good enough” for the guy who wrote that part of the code. He or she thinks that’s the way it should be, he or she doesn’t feel like changing it, every comment about this problem is taken personally like an attack to him/her and if you don’t like it, write your own email program.